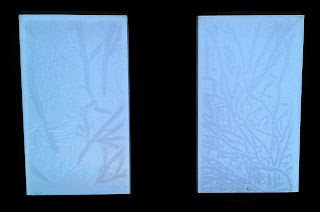 Pretty isn't it and it shows quite clearly that we are warmer inside than out and not leaking heat through the triple-glazing. This shows the amount of energy we've used and how much we've generated using the PV panels and solar thermal tubes. It covers the period from the early September when it first became possible to measure the tube output. Between May and the middle of October the energy usage for two people working (more-or-less) full time in the house was running at just about 18 kWh a day. When the house is empty (but still has fridges etc. and the MVHR running at its lowest setting) the average is 11 kWh. The red spike shows all this changing in the second part of October when the house got cold. When the internal temperature dropped below 18°C we started using extra heating. 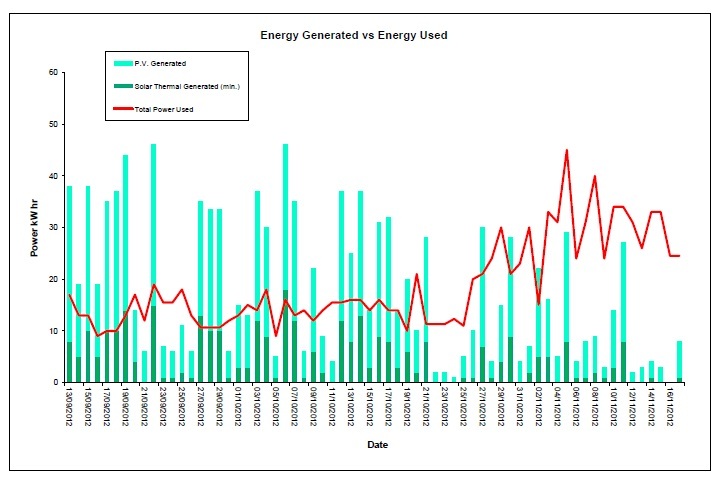 Initially we were just switching on a couple of plug-in radiators we'd bought in the two downstairs rooms and that accounts for the rise in energy use at the end of October. The next spike shows us turning on the top-up house heating. 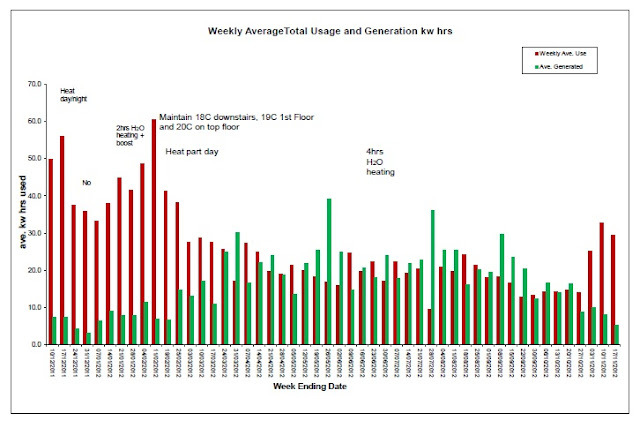 The MVHR has a unit that provides top-up heat but if you look at red line you'll see just how much energy it uses when it's on. We are currently running this just in the mornings to heat the whole house and then using the radiators as before for the evenings. 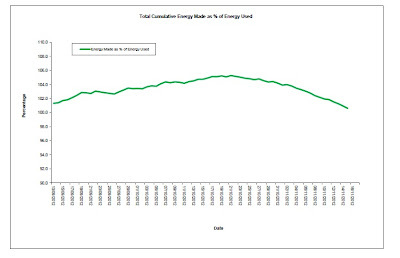 This next graph shows the data for all the past year and illustrates the impact of having the house's top-up heating on. It may be that we have got some of the settings wrong on the MVHR control panel but at the moment the house's own heating cannot heat the ground floor above 18 degrees even when the top-up heating is burning up the kWh so I'd welcome any twitter feedback as to why this is. 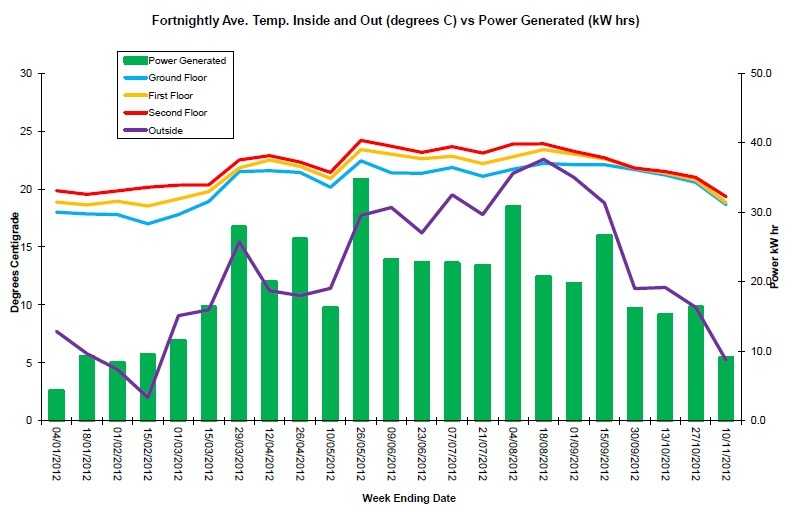 In the chart here you'll see that there is a difference between energy usage now and a year ago. We'd hoped that there would be a difference in the amount we needed to heat the house after a year of occupancy but the house is as cold this winter as it was a year ago. 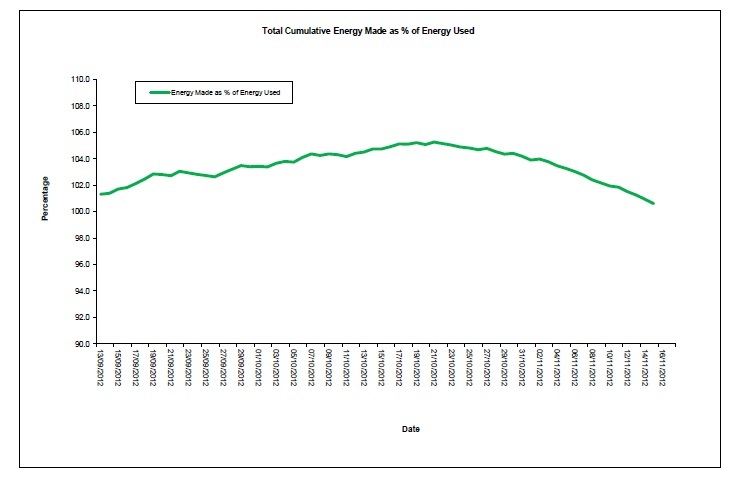 The only difference in energy use now is that last year we were trying to maintain the temperature on the ground floor at 20 degrees so the thermostat was set to that and we were running the house heating for longer. This year, at the moment, we're only heating the rooms we're in and keeping the doors closed to all the rooms. This is saving energy but it doesn't tally with all those cosy images of a passivhaus; I find myself yearning for coal fires and feeling warm. On sunny days the house is OK whilst the sun shines through the big windows but this part of the country doesn't get many sunny days so such treats are rare. Another thing I wouldn't mind feedback on is the impact of windy days on the house - we've had airtight test showing the house isn't leaky, indeed at one stage this was the least leaky house in England(!) but wind definitely has a measurable cooling effect. It's like it drags the warm air out through the vents before the MVHR has had a chance to reclaim the full amount of heat - is that possible twitter? Does anyone else have experience of this? This graph shows the profile of the year with the purple arc of the external temperatures and the year's worth of sunshine. 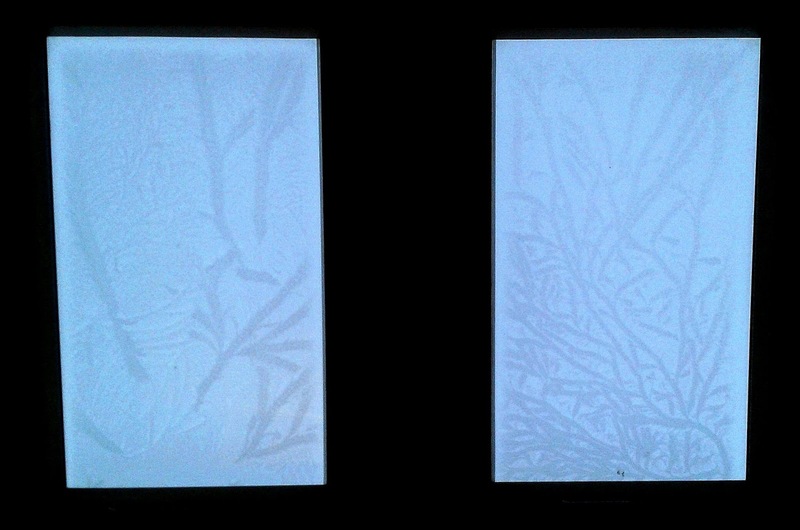 You can see how the three floors had a different temperature for most of the year until the autumn equinox. Does this mean the house has now reached equilibrium you may ask? Nope, it just shows me shutting all the doors on any but the sunniest days in an attempt to stop the heat inside the rooms from shooting up to the top floor. 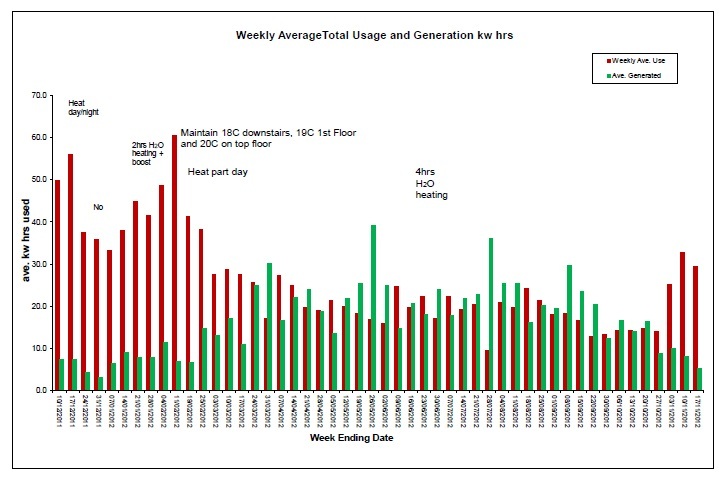 This graph also shows quite clearly that in summer we struggle to cool the house and in the winter we have trouble getting it above 18 degrees on the ground floor. The final graph shows the electricity generation from the PV and solar as a percentage of our usage, despite the best efforts of the English weather. If anyone would like the spreadsheet with the breakdown of all the readings then tweet me - there are several sheets but we're happy to share them with anyone who's interested.